Ah, but isn't success a state of mind, defined by the quality of one's living, the values that one holds and the bedrock of family and friends? Absolutely, but life is defined by paradoxes and how we reconcile them. After all, many a brilliant artist starves to death or goes bonkers, overcome by the sheer weight of market failure combined with the psychological isolation and loneliness that comes from failing to realize one's goals. More to the point, we are not brains in a jar. We are flesh and blood, and for the limited time that we all have on the planet, few of us aspire to live monk-like existences devoid of material wants. Moreover, the field of play that we compete within keeps score in a monetary and asset oriented fashion. You can choose between working with two companies. At one company, you will get to build the product of your dreams, free of time, market and dollar constraints. The only catch is that the product will only be used by very few people, and under no definition will it be a market success. At the other company, you will face all sorts of trade-offs and compromises based on time, dollars, customer requirements, competitive, etc., BUT the product will be used by countless millions of people and be a huge market and financial success. Which company do you choose? Of course, few choices are so binary, but the way interviewees answer the question speaks volumes about how they define success, how cognizant they are of team goals, their embrace of the goodness of caring about paying customers and the like, and implicitly speaks to a recognition/maturity that the art versus commerce paradox is not an all or none assessment. 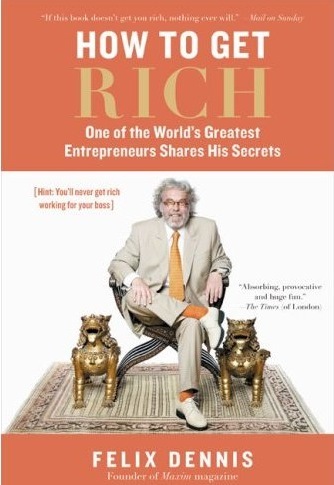 Written by Felix Dennis, chairman of Maxim Magazine (so a bonafide $400M net worth type of rich guy), the book offers sage, simple, clear and actionable truths about the earnest pursuit of getting rich. It's a quick read with straight-up delivery, including decisions made, outcomes realized and lessons learned. It's also a joy to read. And as a wordsmither and lover of good prose, I also appreciate the fact that Dennis approaches his tome with the eyes (and ears) of a poet. The talent? Go sign it. But first wine and dine it. You gotta be in it. To quit or cut bait. And bluff your way through it. The Tyranny of the ALL or NONE: embracing the paradox of the AND in life. All In: on getting rich. Brain in the Jar: on maximizing your time on the planet in terms of productivity.